he celebration of San Giuseppe is the event that best conserves the antique flavor, thus giving us the opportunity to see a series of rituals that through the centuries have more or less remained completely intact. 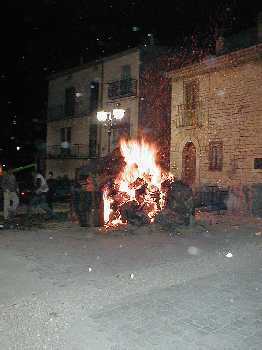 San Giuseppe isn’t just about fires that stay lit for 24hrs in various areas of Morrone, legumes, and the “maccherun ca ndrit”; it is also a scenic event that is still observed with scrupulous regularity by those people that remain dedicated to the distribution of the various “devotions”. 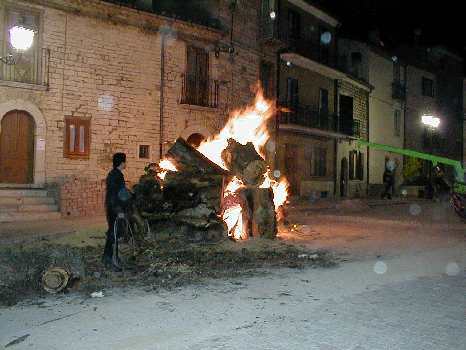 Among the numerous and by no means easy tasks, on San Giuseppe day the morronesi are involved with the “Rite of the Sacred Family”. They choose three people: a man, a woman, and a child; at one time chosen from the poorest of Morrone, and people of remarkable honesty, therefore giving them the occasion to “over eat” at least once a year. At one time being chosen was embarrassing, but today it is difficult to find extremely needy people in Morrone. The three chosen subjects impersonate Jesus, Joseph and Mary, and then in an appropriate closed room a table is set and they enjoy a very “special” lunch that has been prepared for them. Beans, chickpeas, cicerchia’s, fava beans, broccoli raab, white rice, maccheroni, fried red cod, sarda’s, mushrooms, asparagus, snails, citillo, fritters (scrppell), caragnole (nocche), oranges (cut and seasoned with salt), bread, water and wine. A series of prayers precede the lunch, as well as a prayer before every course. There is also a concluding prayer. There are two waiters: one stands always near the door and the other enters only when the table companions bang their spoons on the plate. 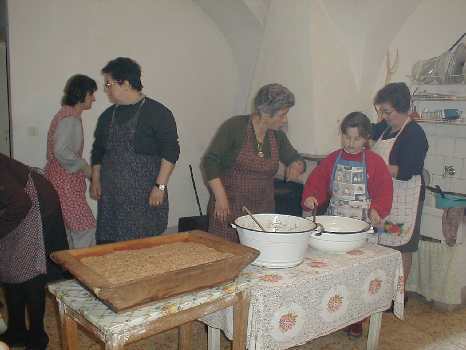 Immediately after, as dictated by tradition, a basket containing the leftovers from the lunch, a pagnotta (a round loaf of bread weighing 4 kilos), scrppell and a dish of ctill are packed into a bowl and brought to the houses of each of the members of the “Sacred Family”. 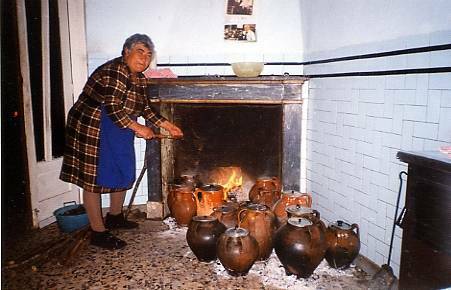 Of the many people involved in this tradition one of the most active is the Signora Filomena Frantangelo (a Cacchiefiell). We must ask ourselves up until when can we enjoy the charities offered by these kind and generous women. We will be able to enjoy it maybe for a few more years if someone takes part in accompanying, continuing, and preserving this tradition that for Morrone and for all the morronesi is a type of family heirloom that should be guarded at all costs. From “Voyage in the Molise” by Francesco Jovine. Those days of March are days in which in town one celebrates San Giuseppe. An old man, an old woman, both poor, and a child are chosen to be the “Sacred Family”. After a solemn mass the man and woman hurry off to the house to which they are invited holding the child by the hand between them. They are cleaned, made to feel at home, remorseful; the child is dressed accordingly in the typical peasant garb, as an adult: grimly with long socks, hiking-like boots with spikes, a shabby round hat; and he glances seriously and gravely with stunned eyes at those that accompany him. Along the main road the trio meets other “Sacred Families” that have the same appearance and the same gait. Once they have arrived at the designated house, St. Giuseppe, the Madonna and the child say: “Jesus and Mary”. The pious family assembles, waits for them, and then responds: “Today and always”. In a little secluded room there is a table set for the guests: the women of the family serve the meal barefoot and silent. Not even the old man, the old woman or the child speak; the entire meal must be carried out in silence, without anyone daring to disturb the atmosphere of austere devotion that is in the act. Although the lunch is 13 courses, maccheroni with fried bread crumbs, beans, chickpeas, rice, escargot, mushrooms, fish, etc…the function is carried out quickly: who knows how hard it is on the two old jaws of the sacred guests to chew that gift from God. They just taste the courses, however, and the leftovers are scrupulously sent to the “coscine” at home, along with an enormous loaf of bread that is like a rock of a threshing floor. Once the “Sacred Family” has left, the common banquet begins. It is louder, more joyful, and with an innumerable amount of guests. The table is prepared and whoever enters and asks on the behalf of Jesus and Mary can seat themselves at the table and eat. They are served chickpeas and beans: big and tepid, well cooked and flavored with salt and olive oil. These legumes are the pride and joy of the women that wake up two hours before sunrise just to put them on the fire in big earthenware pots while they listen to the March winds rumbling in the chimney, winds that are the paternal voice of the Saint granting his thanks and abundance to his devotees. At the table they say that there are chickpeas so big and tasty, beans so white and tender, only the holy goodness of the immaculate patriarch can provide them. Everybody praises the Saint and they eat and drink; but the true vagrants, those bearded, tattered and begging ones that come down from Morrone or Lupara or Castebottaccio for the party, don’t dare seat themselves; they bring a knapsack for some bread and a little pail for some soup. When the collection of alms is finished they leave alone and eat their fill in the shade of the already flowering hawthorn hedges.